Many early ships were wooden and vulnerable to fire. 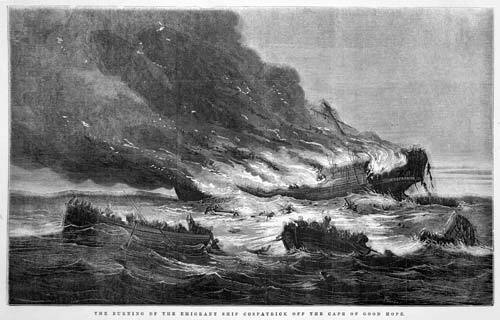 The worst fire in New Zealand’s maritime history, although not in its waters, occurred on the Cospatrick on 18 November 1874. The ship was bringing 433 emigrants from Gravesend to Auckland and was off the Cape of Good Hope in the south Atlantic. The fire probably started when a passenger or crew member, pilfering cargo, set fire to straw. The fire ignited coal, turpentine and oils in the hold, and the ship sank 40 hours later. Two lifeboats with 62 survivors were launched. One was never seen again. The second was found by a passing ship 10 days after the fire, and only 5 people were still alive. Two died soon after being rescued, leaving a final toll of 470 dead.